When it comes to new ideas in the classroom, I either jump in with little to no research, or I hold off for days or months until something throws the idea back into my path. Setting my students up on Gyzny with students accounts was a combination of both. I knew Gynzy offered students accounts but I hadn’t spent much time researching them so I never got around to it. Last week I was exploring on Gyzny (I wish I had unlimited time for that) and spent some time looking at their Lesson Plans. I noticed that there are three pages of math lessons for 4th grade. It’s been awhile since I explored this area of Gynzy and I’m amazed at how much has been added. For instance, I found a lesson about multiplication. This one is perfect! I should have used it last month! It covers two Common Core Standards. But, I’m short on time right now and haven’t planned time to review multiplication until after the holidays. My solution is to have my student log on to their own Gynzy account, work individually through the lesson plan I found. So, today in computer lab I had my students create student accounts in Gynzy. Creating accounts took less than two minutes and then they were off. The students were allowed to play around and explore. Since we use Gynzy daily in class, no instruction was needed. Let’s take a moment and appreciate that this student was exploring the map of the United States when she could have been drawing. Unfortunately, I missed taking a picture of my ELL student writing and solving multiplication problems. Three students even asked me if they could log on and play at home. Um, yes, please! After exploring Gynzy I gave my students the task to open the multiplication lesson. This lesson plan starts with having students multiply a one digit number, moves to partial products, multiplying by a two digit number, and ends with a quiz. 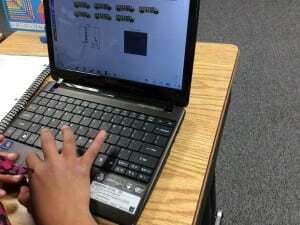 The lessons can be used whole class, small group or individually. Since we have moved on to division, this 15 page interactive lesson is the perfect review for my students. 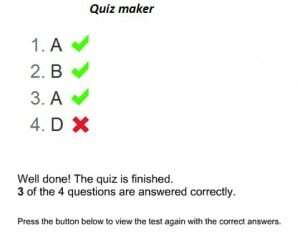 Check out the results that pop up once the quiz is complete. What’s nice about this is students are able to work at their own pace and go back to previous pages when needed. I heard great conversations start when neighbors were asking for help or general discussions about what was on their screen. Amazingly, even though the students were working independently, with some input from their neighbors, no student asked for my help. They were content to explore at their own pace. 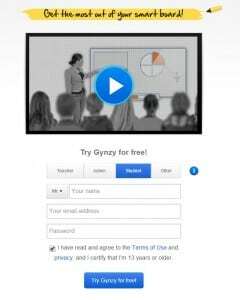 Since Gynzy has all the answers right there for the students, they were able to check their work and move forward or go back and review. A few days later I assigned them free time on Gynzy though Google Classroom. They were allowed to look through the lessons and select one in an area they need practice or would like to learn about. At the end of the time, the students had to tell me what lesson they tried and what they learned. As always, the students informed me that they had fun and they were able to learn about the topic they explored. What a perfect combination!